Around ASCO time GSK was a promising stock being touted by life science investors as one of those undervalued stock that you can go both long and short. Even with the Avandia scandal going on, you’d think that GSK is almost invincible. Headlines around Avandia still dominates investor consciousness and even though GSK is more than Avandia, this goes to show that a little bit of bad news that lingers on too long can hurt investor confidence and such ambivalence has been playing out in GSK stock price these past couple of weeks. 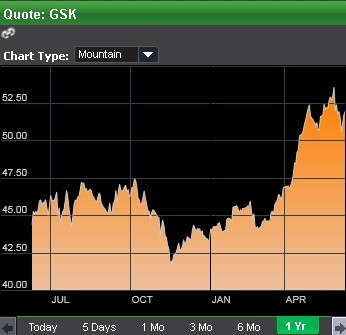 $GSK needs to get close to $52.50 and break past this to regain investor confidence. The stock price seems tentative about it, teasing that $52 threshold.